Customers at the Exeter Vale store voted for the cash to go to Pete’s Dragons as part of the supermarket’s Bags of Help scheme. The vital funding – from the sale of plastic carrier bags - will aid the Exmouth-based charity in continuing its work supporting hundreds of suicide-bereaved people across Devon. 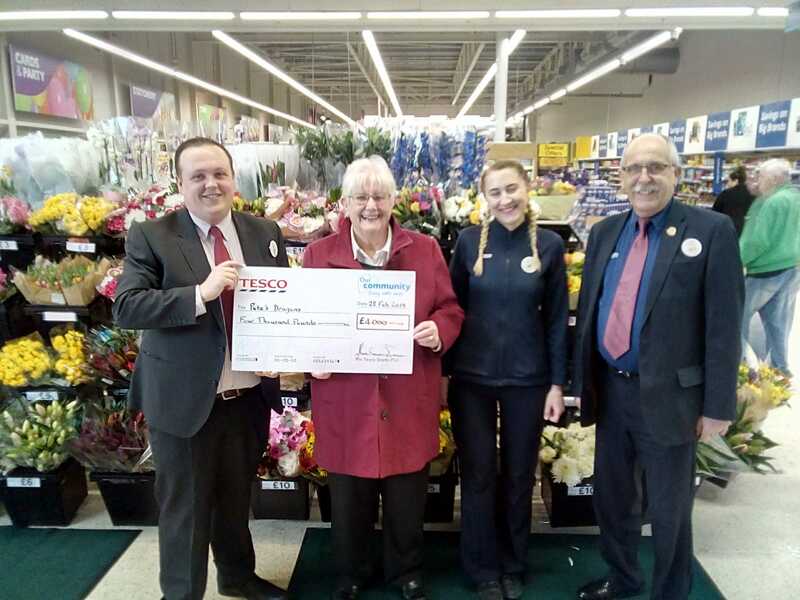 John Smith, of Tesco’s Combined Community Team, said staff at the superstore were ‘delighted’ to hand over the funds, adding: “It is always interesting to get the ‘inside story’ of the charities who benefit from the Bags of Help scheme. “Pete’s Dragons gave us an insight into a very difficult area of human life which many would probably, and understandably, wish to ignore or ‘shrug off’ as being just too difficult to deal with. However, this sort of sadness and family devastation is, unfortunately, all too common today. We, therefore, hope that this award will help the charity to open all our minds and to help all those in our area who find themselves in such difficult and traumatic circumstances. “We continue to be amazed by the voluntary dedication and hard work, by ordinary folk, that goes into organising, running and maintaining charities like Pete’s Dragons, often on a very local basis. They all deserve a medal. They certainly deserve our support. Alison Jordan, Pete’s Dragons CEO, said that the charity continues to be overwhelmed by the support it receives from Tesco and its shoppers. “The votes we receive reflect the importance that the community places on the service we provide,” added Alison. Pete’s Dragons was founded by Alison after her brother, Pete Wicks, took his own life in 2010 at the age of 24. The charity provides a bespoke service to anyone in Devon who has been affected by suicide bereavement. It is the only suicide bereavement support service of its kind in the South West and the most comprehensive service in the UK. Bags of Help, run in partnership with environmental charity Groundwork, sees money raised from the sale of carrier bags awarded to thousands of local community projects every year. Tesco customers choose one of three local projects they would like to get the top award using a token given to them at the checkout.